Steve Ballmer told financial analysts today that yesterday's 'magical' deal with Yahoo! will mean new products, better search and more economic value for both companies. "Nobody gets what really happened yesterday," he said. "We get a chance to put together our scale and Yahoo! 's scale." "Scale is a tool for product improvement. The more queries you see, the more you can tune your product." "The more scale you have, the more advertisers advertise on your system, and the more relevance their ads have for your users. It's also about increasing our understanding of our customers." 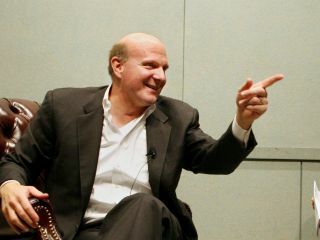 Speaking at the Microsoft Financial Analyst Meeting 2009, Ballmer emphasised how the deal gives benefits for both companies: "Nothing got bought and nothing got sold yesterday, but the partnership creates real economic value. Not just on the future promise of improved products, but there are immediate opportunities for synergy. Our costs should be lower than they are today." "For Yahoo!, the deal is also about really focusing on its leadership in online media. We will continue to compete with them MSN but Yahoo! is the leading media company in the world." Ballmer noted that Yahoo! expected its profits to increase 70 per cent. He went on to call the deal, "A magical way to create revenue and cost synergy. We're excited about our long-term 10 year deal."